The amount of data available today is providing utilities with the information needed to operate more efficiently, effectively and safely. Predictive analytics solutions transform raw data into actionable insights, allowing utilities to prioritize maintenance activities while reducing operational and maintenance expenditures. Predictive asset analytics software detects subtle changes in equipment behavior that are often the early warning signs of failure, enabling operations and maintenance personnel to address equipment issues before they become problems that significantly impact operations. Unscheduled downtime can be reduced because personnel receive early warning notifications of developing issues. These advanced analytics solutions can identify problems days, weeks or months before they occur, creating time for personnel to be proactive. Instead of shutting down an asset or a section of the plant immediately, a problematic situation can be assessed for more controlled outcomes. Loads can be shifted to reduce asset strain or the necessary maintenance can be scheduled during a planned outage. Predictive analytics software allows for better planning which in turn reduces maintenance costs. Parts can be ordered and shipped without rush and equipment can continue running while the problem is being addressed. Predictive analytics tools also help personnel visualize actual and expected performance of an asset including detailed information on ambient, loading and operating conditions. Operations personnel become knowledgeable regarding where inefficiencies exist and their impact on financial performance. They can gauge the future consequences of the actions and decisions they make in the present. Risk assessment becomes a more exact science and the potential behaviors of each monitored asset and can be used to better prioritize capital and operational expenditures. Additional savings are realized when considering the costs that “could have been,” including loss of power, replacement equipment, lost productivity, additional man hours, etc., when a major failure is avoided. Consider this example. A large North American power utility was able to save an estimated $8.9 in avoided costs in one year because of the early warning detection provided by Schneider Electric’s Avantis PRiSM predictive asset analytics software. In one catch, plant engineers were alerted via an email notification from the software that an aging steam turbine experienced a vibration step change. The appropriate personnel verified that a proximity probe and casing vibration had both changed, and further analysis indicated a likely loss of mass in the turbine blade path. They immediately suspected shroud material had been lost, based on the unit’s history. It was determined that the unit could continue to run at a reduced output, under increased observation, until a more convenient and strategic time to bring it offline. Once it was brought offline, a borescope inspection verified missing shroud material and several other segments that were close to liberating. Had this issue not been identified with predictive analytics software, it could have caused immediate unplanned downtime, loss of generation, possible catastrophic failure and danger to personnel. The vibration step change had not been significant enough to alert the operations staff of this impending condition through standard monitoring practices. The early warning notification and the following staff action resulted in a potential estimated savings of more than $4 million in lost revenue and repair costs with this one catch alone, in addition to maintaining the safety of the operating engineers. For more information, check out our recent article “Optimizing Electric Utility O&M with Predictive Analytics” in Electric Light & Power magazine. 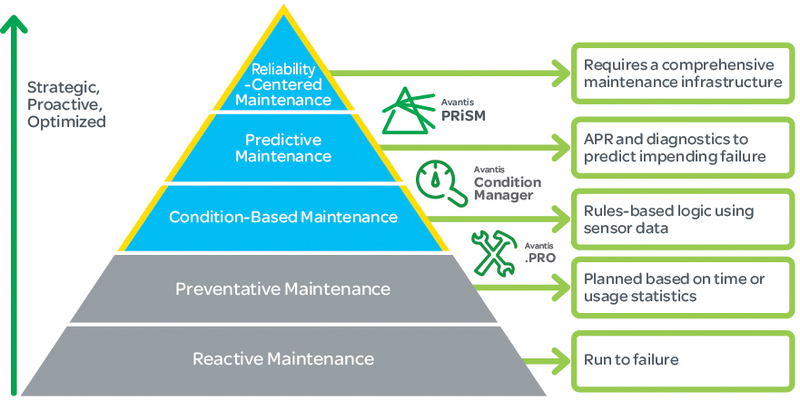 Predictive maintenance is a strategy for operational efficiency and good return on asset in a plant. I hope all critical aspects of our facilities will be managed with a tool such as this. Really this is very helpful blog for us. And predictive analytics technology is also helpful for online e-commerce business owners.